David Horowitz is one of premier conservative intellectuals of our day, and integral to his written works are two essential elements: passion and sublime prose. Horowitz received his undergraduate degree from Columbia University, and his Masters Degree in English Literature from the University of California, Berkeley. He is the author of a plethora of books. However, it is specifically the works penned after he parted ways from the left for which we are most grateful. These include titles such as The End of Time, Radical Son: A Generational Odyssey, How to Beat the Democrats and Other Subversive Ideas, The Anti Chomsky Reader, Destructive Generation: Second Thoughts About the Sixties, The Art of Political War And Other Radical Pursuits, The Politics of Bad Faith: The Radical Assault on America's Future, and Uncivil Wars: The Controversy over Reparations for Slavery. Outside of his individual publications, many on the right are primarily familiar with him due to the flagship conservative website he founded: www.frontpagemag.com. David Horowitz, far more than any other conservative figure I have interviewed over the past few years, has been a decisive influence in my life. I was raised in a family of traditional liberals, and, perhaps for this reason, I never had much of a interest in politics. In 1991, upon graduating from my, at the time, politically incorrect Catholic university, PC ambushed me via the voices of conformist individuals I had the misfortune of meeting. This resulted in my forming political views which were, unfortunately, isolated to a hatred of cultural Marxism in all its manifestations. Although, it is with considerable shame that I admit to voting for the Democratic Party up until the 2000 election. In May of 2000, I officially joined the conservative side after reading David Horowitz's book, Hating Whitey. Upon finishing the chapter, "The Manchurian President," I knew that I would never vote for the Democratic Party again. 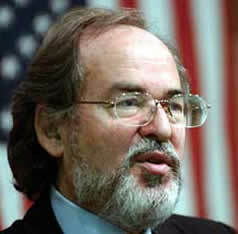 I am forever indebted to David Horowitz. BC: Mr. Horowitz, thank you for taking the time to answer a few questions. First, I wanted to note how ironic it is that you began your career fighting for free speech at Berkeley, and have ended it fighting for free speech against the people you graduated with from Berkeley. Why do you think so few of your peers continue to have second thoughts about being on the left? Also, for those who might not be familiar with your experiences at The Second Thoughts Conference, why do so many baby boomer radicals refuse to reconsider the destructiveness of the 1960s? DH: As I have written on many occasions – most systematically in The Politics of Bad Faith -- the left is a religious – or crypto-religious – movement and real world events which refute its religious illusions often have little impact on the believers themselves. BC: Your excellent, and now retired, magazine, Heterodoxy, was one of the first to lampoon political correctness, would you agree that laughter is the best way in which to dismantle cultural Marxism? DH: Our intention was ridicule because the university is by now such a one-party state that its leftist ruling class has no need to respond to critics and does not. BC: PC seems to be something akin to feminism, few normal persons defend it, yet many are cowered into following its diktats. Why do you think political correctness, as goofy as it is, continues to oppress the masses in the manner it does? DH: Political correctness is just another name for an ongoing witch-hunt, in which labels like "racist," "sexist," "homophobic," and "right-wing" can destroy academic and political careers, and regularly do. Why wouldn't they continue to intimidate people with these results. By the way, the masses are not the targets; intellectuals and professionals are. BC: I read something online the other day about the personality antecedents intrinsic to the possession of a politically correct worldview. There was a point about how it provides its followers with "instant morality." Do you think that a need to feel superior is the primary motivation behind its widespread appeal? Is it just a well-disguised excuse for people to look down on others? DH: Yes. The left is pathological in its self-righteousness. This is the oxygen it needs to exist at all. Considering the tens of millions of people it has murdered and the hundreds of millions whose lives it has made miserable, the need for a moral melodrama that would make it feel good about itself is obvious. BC: Speaking of political correctness, as a person who visits our universities on a regular basis, has the situation improved recently? DH: Only in that there are more people complaining about it. University faculties are dominated – not in numbers but in the ability to intimidate others – by a left that is totalitarian to its core. BC: In terms of the left in general, I am exasperated by their seeming intent to implode our nation through their support for unlimited immigration, unlimited taxation, and the general celebration of our enemies. Is it not accurate to describe today's left as being intent on our nation's destruction? Are they not a death cult? DH: The left has always sought the destruction of the American system – its constitutional framework, its democracy, its institutions of government. It is now in full-throated opposition to the war on terror – which is a reflection of its delusion that the terrorists are "freedom fighters" and we are the oppressor. BC: Would you say that going to speak at some of the leftist Death Star colleges has had a positive impact on the environment upon those campuses? I can't help but think that the crazed, inappropriate reaction to your presence might sway some moderates into being sympathetic to your views; which means you've accomplished some good just by showing up. Or, as in The Art of Political War, when your future wife was so put off by the rudeness of leftists that she became a conservative on the spot. DH: Showing the flag is essential to winning the war. BC: One of the reasons you've been effective in battling the left is that you have adopted some of their tactics by fighting fire with fire. I'm always amazed at the way some conservatives treat political debate as a parlor game. Do you agree that one of the problems within the conservative movement is that there are too many gentlemen and not enough Ann Coulters? BC: As someone who, along with your partner Peter Collier, created a conservative publishing house (Encounter), would you say that booksellers and editors continue their subtle discrimination against authors of the rightward persuasion? There's a personal Horowitz link to this question. After I told my mother, a second guessing sixties liberal, about how much I enjoyed Uncivil Wars, she attempted to buy a copy at a Borders in Detroit. She was told that they didn't carry the book. She eventually bought one online from Amazon. Are such stories fairly common? DH: Yes. But I had no role in the creation of Encounter Books. BC: What is your outlook for our cultural future? As a conservative, it's all too easy to be reflexively pessimistic. Is there room for hope that many uniquely western values will endure for later generations? DH: Americans are an incredibly resilient people. Their enemies on the left haven't a clue as to how to organize a society or create an economy that is productive. We will prevail. BC: Your most recent publication, The End of Time, was a most unique book as it was endorsed by the likes of Dr. Stanley Fish. With its humble and humane tone, has it personalized you in the eyes of your enemies? Has it brought about any reconciliations? DH: No. Despite the fact that it is the best book I've written, It hasn't received a single review in the mainstream media, and aside from Fish and Walter Isaacson, whom I sent it to, I doubt that a single liberal has read it. BC: What's your next project going to be? DH: A book called The Professors, whose subtitle might be "a hundred academics you don't want to know." BC: That's one I can't wait to read, and I thank you very much for your time, Sir.